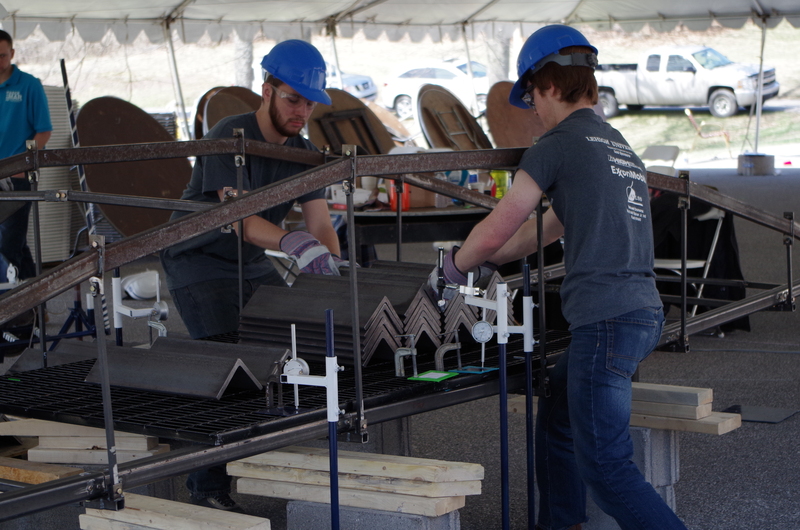 Last weekend the Lehigh Steel Bridge team and I attended the 2015 Steel Bridge competition hosted at Penn State University Park. 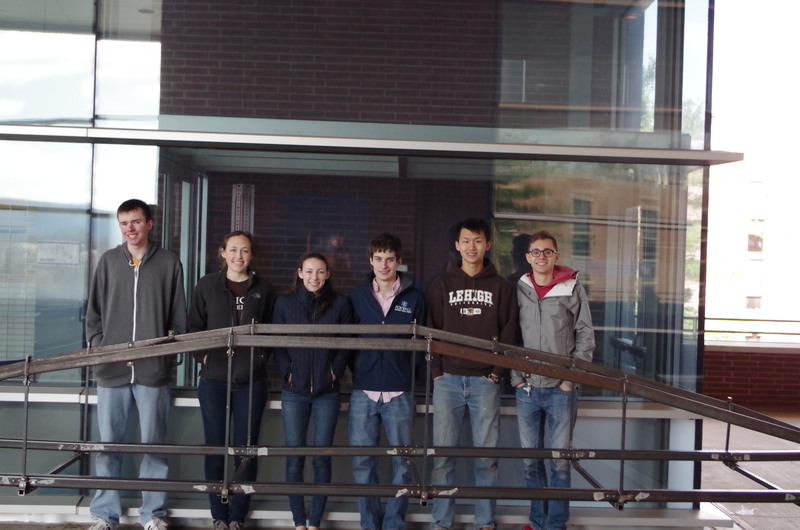 The team was comprised of the build team (pictured above and the executive board (pictured below.) This year Lehigh competed against U of Maryland, U of Delaware, Johns Hopkins, Temple, Villanova, Lafayette, Pitt Johnstown, Bucknell, Morgan State, and Penn State Main. The competition is a two-day event. The first day holds the visual aesthetics judgement and also a presentation on a paper prepared by the team along with some meetings thrown in the mix as well. The first day is pretty leisurely. We show up to the judgement spot and take our time putting our bridge together. Once that is done we usually see the other bridges and take notes on design aspects we might like to incorporate for next years bridge. Once that is done usually the paper presentations occur. This year I think the paper was on ethics in engineering and how it can affect the industry. After the presentations there are a bunch of meetings that the captains attend about the rules and regulations for the competition the next day. Then after that we packed everything up and headed back to our hotel with the rest of the night off. However, we finished building our bridge only the day before we left for competition so we did not have much time to practice building it. So that night we practiced building our bridge at our hotel and then went to bed. The next day was the day of the actual competition. We woke up early and had to drive to the grounds we it was held, about 20-30 minutes from main campus at the Civil Engineering lodge. By the time we got there the first two teams were already building their bridges. 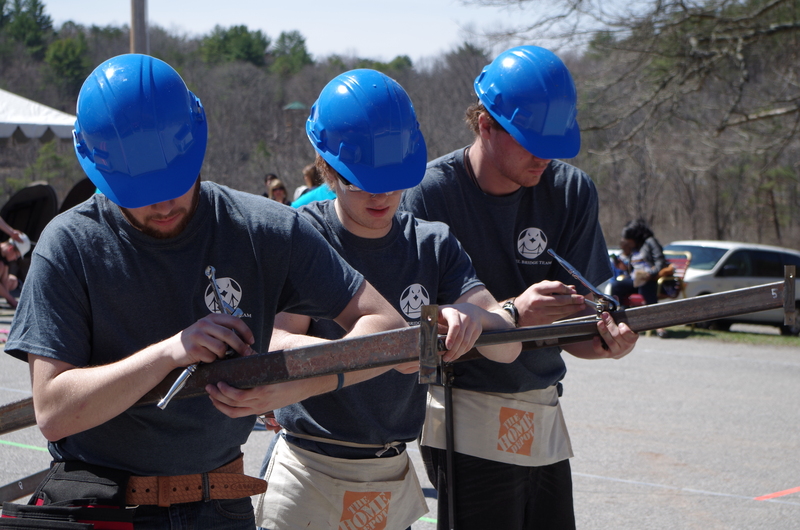 Basically the way it works is your team is given a specific time slot to build the bridge. The rules are that the bridge must be built within 30 minutes or else you incur a huge time penalty. After 45 minutes you are disqualified but still allowed to finish building and you can still load test. After the building is finished you move the bridge to be load tested. First is the lateral load which is 75 lbs across the bridge. 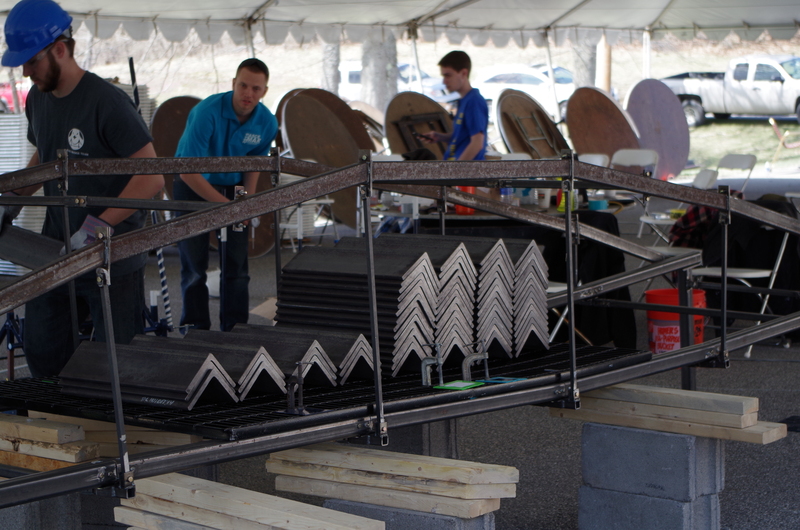 If the bridge deflects below a certain threshold then it moves onto to be vertically tested. In the vertical load test over 2000 lbs is applied to the bridge via 25 lb plates the bridge team members apply themselves. If it passes that test they factor all of your scores/penalties together and give you a final score. The top three teams then advance to the next round. Below are pictures of the lateral and vertical test. Now for the results. This year was much better than last year. 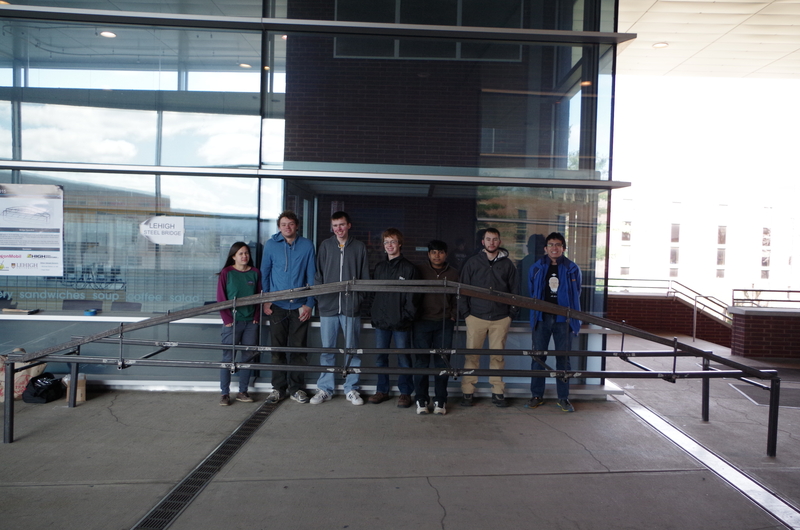 We ended up being disqualified because we took too long building our bridge. However once it was constructed we were able to load test it. 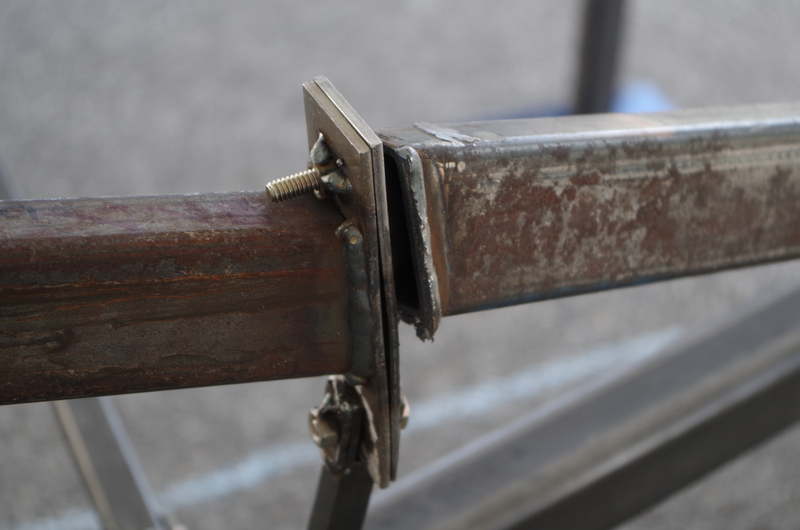 It passed the lateral test easily (this is what disqualified us last year.) Then in the vertical load test it supported 1750 lbs! Compared to last year it was a much better performance, though far from perfect. I think our biggest problem was our connection design. The connections are the most crucial part of the bridge. This year we used simple vertical plates and bolted them together in a few places. 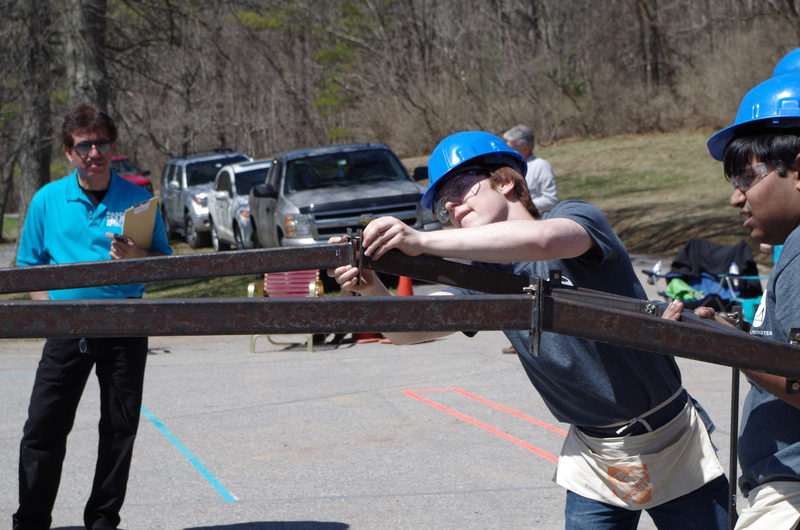 This lead to a very large number of bolts compared to other teams. This in turn leads to longer build times. Also, one thing nobody thought of was that the 1/8″ plates would bend during construction. 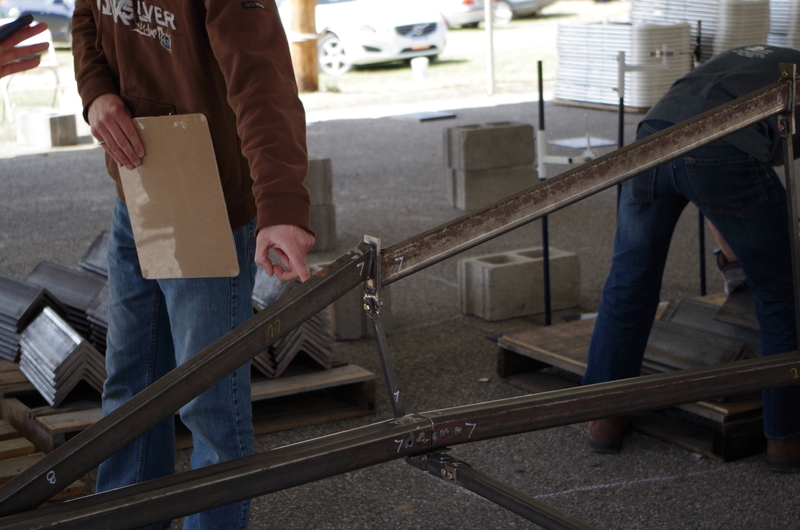 The more we practiced building the more bent the plates got which in turn made building it more difficult. 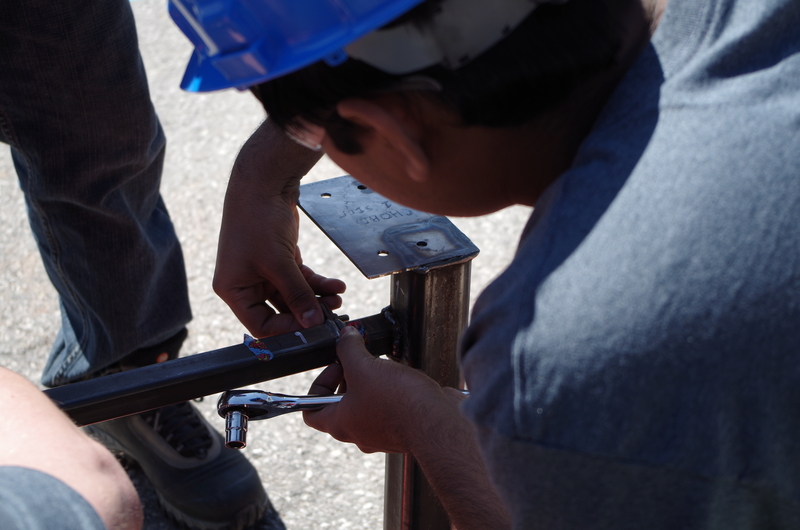 This year we noticed that a lot of teams got their connections professionally fabricated, something we had the budget for this year but decided against. Next year I will be focusing on connection design to avoid a repeat from this year. We need connections that not only facilitate the build process but are also more effective in handling stress. All-in-all though it was a great improvement over last year and a fun trip too. I’m excited for next years competition already! 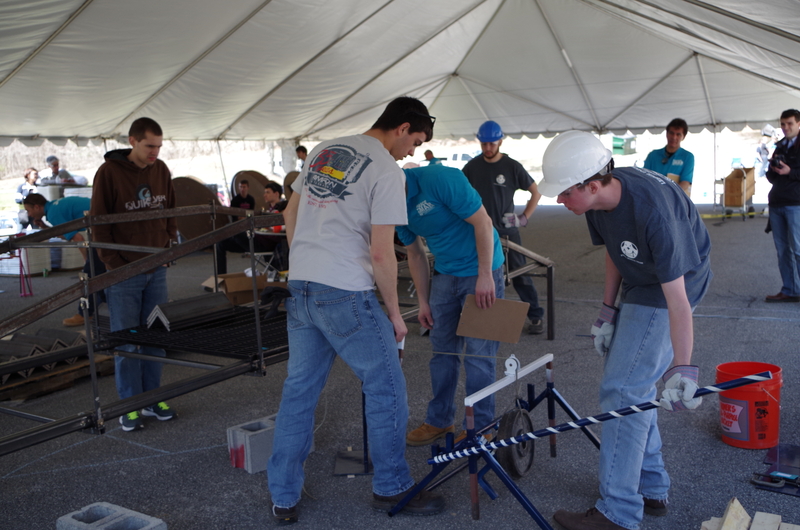 Below are pictures of the crew building the bridge and also the results of the load testing.